The only way to get better at golf is to hit golf balls, lots and lots of balls. But getting to the course is not always an option. The Floppy Indoor Golf Ball is a practice golf ball designed for indoor use. Invented by Up & Down Inc in Santa Barbara California specifically for use with the short irons and wedges. At the time the only suitable practice balls in existence were the super lightweight plastic balls or semi-soft foam balls. Whilst these provide a ball to hit, they proved too light to provide any meaningful feedback to the golfer. The goal of The Floppy was to create a practice ball that could mimic a real golf ball yet was safe to use in and around the house. Allowing the golfer to practice their game, anytime, anywhere. The specially engineered liner is firm enough to provide feel off the club face and soft enough to deform on impact allowing The Floppy to be safely hit into a window or wall. The free movement of the proprietary fill is the clever part providing the sensation of hitting a heavier ball and thus offering realistic golf ball feedback. To protect any delicate household surfaces, and to enable the club to grip the ball the outer cover is constructed from a soft, durable, hand-woven material that is made to last. 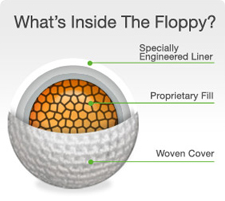 The end result is a high quality product that feels, rolls and spins like a real golf ball. Made by Up & Down, Inc. in our factory in China, each Floppy ball is hand made and has been designed to last for years. If your ball becomes dirty or the cover becomes loose, you can simply wash them in warm soapy water and let them dry. The cover should shrink a little and offer you a more firm and rounded ball.